Why Youth Tennis Progression? Where Am I? How Do I Start? The USTA Southern Grandfather Clause will place current USTA 10 and Under players in a Youth Tennis Progression level based on their past results. Players will receive a letter from their state indicating this initial level. More details are in Grandfather section below. Junior Team Tennis is structured around Advanced, Intermediate and Beginner Levels and placement will be determined by using Junior Ratings, JNTRP Descriptions and the applicable 10U USTA Southern benchmark. Players will receive Stars for JTT participation. Participation Stars for 10U players playing in a 10U division are automatically added to a players’ profile. If a 10U player participates in a 12U division of a Junior Team Tennis program, Participation Stars can be entered manually upon request. You can click here to submit the Participation Credit Request Form. What is the Grandfather Clause? If a player has a Southern Standing of 1-100 in the 10 and Under age division as of October 1, 2016, they will be initially placed into 10 and Under Green. Otherwise, players will be assigned the levels below based on their state points earned in the 10 and Under age group. If a player has a top 300 Southern Standing in the 12s-18s division as of October 1, 2016, he/she will be initially placed into 12 and Under Yellow. 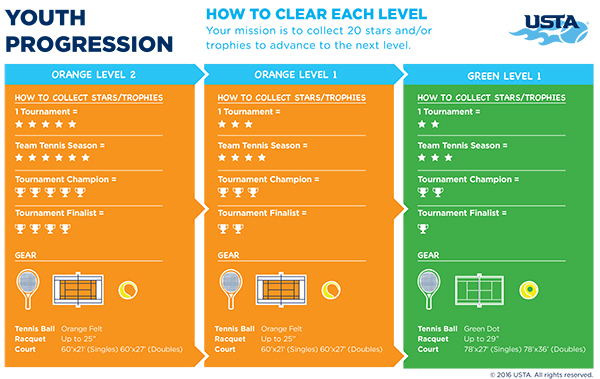 Otherwise, players will be assigned the levels below based on their state points earned in the 10 and Under and 12 and Under age groups, and the highest Youth Tennis Progression level earned will be assessed. Players will contact their state Youth Tennis Progression staff member listed here to speak with them directly about Youth Tennis Progression in their state.